The Telemark Art Center is pleased to introduce its Migrating Societies project to the people of Telemark region and beyond. The three-year project promotes the exchange of art and ideas between Skein, Norway and the Twin Cities of Minneapolis and Saint Paul, Minnesota. The initial phase of the exchange is the dual exhibitions Migration Series #1: Pao Houa Her and Wendy Red Star at the Telemark Art Center, and Markers Of Time: Prints by Marilyn A. Owens at Soo Visual Arts Center in Minneapolis. The two shows were curated by Ida Marie Tenvik-Bringedal, director/curator of the Telemark Art Center in cooperation with Todd Bockley, director of Bockley Gallery in Minneapolis. It could be said that the act of migration is the existential core that unites the photographic practices of Pao Houa Her (b. 1980), of Saint Paul, MN, and Wendy Red Star (b. 1981), of Portland, Oregon. In unique ways, their large-scale photographs illuminate the experiences of groups of people who, at one time or another, undertook profound migratory journeys both geographical and cultural. Although their work springs from dissimilar motivations, both artists photograph meticulously constructed tableaux and share a common visual language – stylized scenes whose very artifice reminds us of our deep cultural misperceptions or common ignorance. 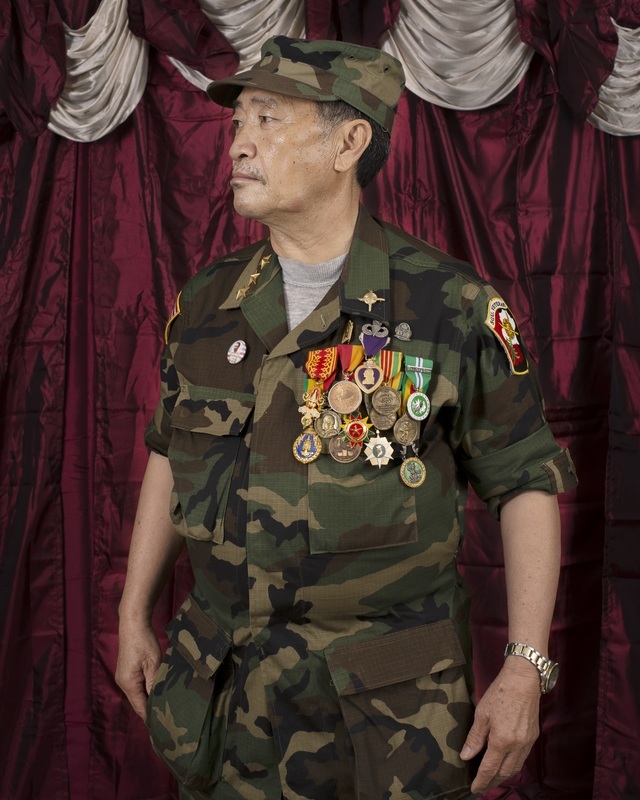 Her’s photographic series Hmong Veterans, 2012-2015 documents the largely forgotten Hmong Vietnam War veterans, many of whom immigrated with their families to Saint Paul, MN, in the late 1970s and 1980s. The CIA and the U. S. government backed the Hmong, an ethnic group indigenous to Laos, during the Vietnam War to fight the North Vietnamese in Laos’ treacherous landscape. This heroic military strategy on the part of the Hmong warriors is known as The Secret War. In spite of their heroic service, the U.S. Military does not recognize the Hmong veterans. Consequently, they purchase or make the uniforms and medals that they wear, to rightfully acknowledge their service in the U.S. military. In Her’s photographs the Hmong Veterans wear military dress of varying types and ranks, and stand stoically before a curtain of rich burgundy brocade. Appropriating visual cues from presidential and military portraits – brocade and tasseled backdrops, dramatic lighting and stoic gazes - Her has given these men a public face and a clear measure of dignity by working within the tropes of the official portrait genre. The surface of the prints is lush, even luminous and the men’s faces and dress are highly detailed. Her gave each a photograph of his choice as a gift. For Her, the portraits of Vietnam War veterans are laced with personal meaning. She was born in Laos in 1980 and, after the Americans exited, her father fought the communist Vietnamese and Laotian military that were massacring the Hmong. In 1983 he fled with his family to Thailand where they lived in camps. They arrived in Saint Paul in 1986. Thus, these works are an extension of Her’s own cultural history, a chapter of migration that she experienced as a small child with only partial understanding and which has shaped her life profoundly. Wendy Red Star was raised on the Crow Indian Reservation near Billings, Montana. In her photographs, Red Star often synthesizes elements and memories of her life on the Crow Indian Reservation with aspects of the larger outside world. Her work explores issues of personal identity, the veracity of American history as taught in schools, and the intersection of traditional Crow – Apsáalooke - culture and contemporary American life. The forced migration in the 1800s of Native Americans - whose tribal lands spanned the continent - to often uninhabitable reservation lands, at the hand of the US government, is truly a low point in American history. plastic snowflakes. 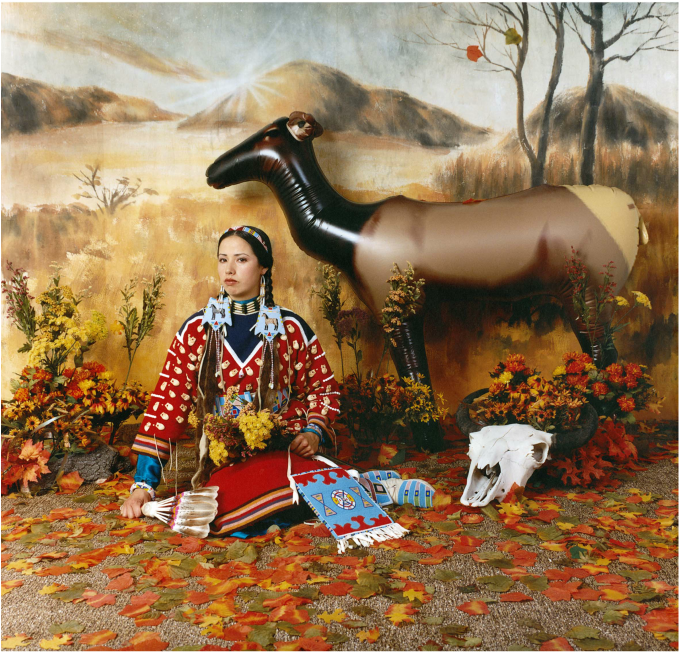 To magnify the stereotypical notion of Indians, she surrounds herself, in boutique-shop fashion, with props that range from inflatable deer and steer skulls, to plastic flora, and collaged images of rabbits and wolves. 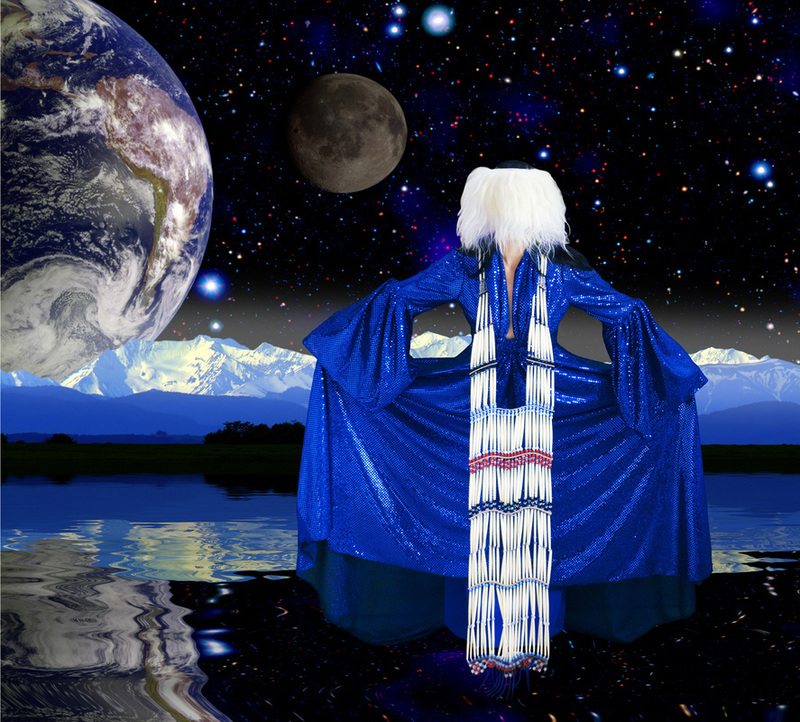 Employing a similar constructed tableaux stage set for her Thunder Up Above series, Red Star dresses in even more elaborate clothes - which suggest types of traditional dress - and poses before intergalactic, Star Wars-like backdrops. The fantastical Thunder Up Above series originated when Red Star began to explore notions of the future. “Each figure represented in the photographs stands as the First People (Natives) in the Final Frontier,” Red Star explains. “I relate this to the first contact that Europeans had with the New World and how strange they [must have] felt the Native communities were. In the end, Wendy Red Star’s photographs investigate the still widely held, received notions about Native American/First People tribal culture. In contrast, Pao Houa Her depicts the reality of her subjects, the Vietnam War Veterans true story, not a fictionalized – or non-existent - account of their history and culture.